I’ve mentioned before that Heart of the Bride has an orphanage in Haiti. They are planning a relief/gospel ministry trip on February 12 and have worked out a great deal on cargo. They are looking to take 6,000 pounds of stuff and need $12,000 to do it. 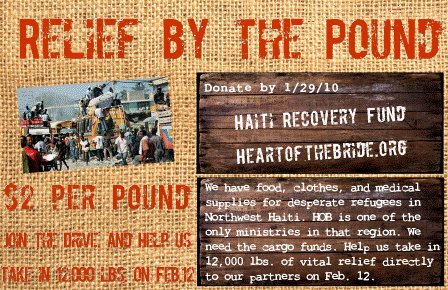 Please consider donating now at heartofthebride.org/haitirecovery. Also, pray for the team that is being assembled. There will be a great gospel ministry going on with the relief effort. Read this about what’s happening with the orphanage. Thanks for your help. You can make a difference now.